WRIGLEY FIELD — We're just as eager as you to see the Chicago Cubs win it all. Good news is, we finally know when the club will be kicking off its postseason run. The first two games of the National League Division Series will kick off at 8:15 p.m. Friday at Wrigley Field, Major League Baseball announced Monday. Game 2 will start at 7:08 p.m. Saturday. As the No. 1 seed, the Cubs will play the San Francisco Giants, who beat the New York Mets Wednesday for the National League Wild Card seed. The Cubs will have to best the Giants in the five-game series to advance to the National League Championship Series. Game 3 will be an away game for the Cubs, making Monday the earliest possible date the team could clinch. Otherwise, game 4 will take place Monday in San Francisco, and game 5 is set for Oct. 13 in Chicago. 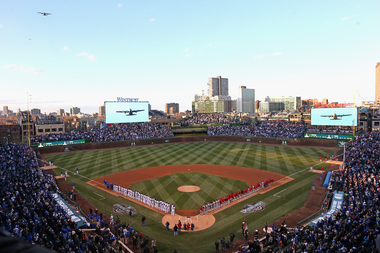 If Chicago advances, the team will face either the Los Angeles Dodgers or the Washington Nationals in the National League Championship Series for a shot at the World Series.